interesting to read your post on stationeries. i love them myself. how about a post on elegant perfumes for men and women? or do you not use them? The inbox has been full of interesting questions lately — thank you one and all! There are those who will tell you that a man should simply smell clean. Soap and water, that’s the ticket. And there are some very nice soaps out there. Delightful stuff. Just ask Meg. When we’re dealing with scent, we are talking about one of the most intimate luxuries. After all, we apply it to bare skin and it interacts with our unique chemistries. There is science involved here — topnotes, bass notes, middle, finishes, etc. . Here are the two things that you need to know about cologne/perfume: how it smells on you and how long it lasts. During my brief stint as a ballroom dance instructor, a new student walked through the door. He was of middle age, well-preserved, full head of salt and pepper hair, easy and elegant clothing of the Polo variety (band collar shirts, well cut khakis, good loafers). He drove a Jaguar — British racing Green with a tan leather interior, of course. Nice fellow. Smelled awful. His choice of cologne, I’m sure it was a fine and trusted brand, just didn’t react well with his natural scent. He smelled like a dung heap. Try a small bottle. Lesson two: A sample size is still best. About how long does the scent last? At $100 + a bottle, how often are you going to have to reapply? Scent is big business and your elixir of choice is liable to be costly. Good ingredients, an exclusive blend, marketing and other overhead costs all add up. By taking some home, you get a chance to wear it around without being overly conscious of it. Run it by your significant other by wearing it around and waiting for a reaction. A strong reaction either way is good. Parfum, also known as fragrance, is the highest concentration of essential oils with very little in the way of water and alcohol added. Eau de parfum is the top of the heap when it comes to longevity and is what I think of when I want to buy Mrs. E.”Coco by Chanel”, her signature scent. This is the real thing, heady, lasting, deep. Expensive. Eau de cologne is the runner up. It will last a shorter time as it is a bit more diluted than the parfum. This is normally what Mrs. E. winds up with. Colognes may be worn by either men or women. Acqua di Parma is a classic invented in the 1930’s to be a unisex cologne. Mrs. E. doesn’t like it on me. Eau de toilette is the least expensive and the shortest lasting of the three. Think of it as the lightest mixture. It is the least expensive. Safari for Ralph Lauren is a good example. Mrs. E. prefers this scent on me as I wore it when first we met. Which is why I continue to wear it. As personal as scent is, it is hard to recommend one over another. I tend to grassy, green, woodsy and citrus scents. I also like Vetiver (Guerlain made the archetypal) and used to wear it when we were in France, as I could easily find a version in Grasse. As a young pup I wore Kouros, but it didn’t last into my whisky soaked majority. There were dalliances with Polo, Jazz, Égoïste, Trafalgar 1805, St, John’s Lime, but I’ve more or less settled on Safari until I find the perfect cologne. The important thing is to not overdo it. Scent, like wearing braces, should come as sort of a surprise. This entry was posted in Elegantology and tagged Acqua di Parma, Cary Grant, Coco by Chanel, Creed, Égoïste, Grasse, Green Irish Tweed, Guerlain Vetiver, Jaguar, jazz, John's Lime, Kouros by YSL, Lucky Scent, Pigtown-Design, Polo, Safari, St, Trafalgar 1805. Bookmark the permalink. There are three people I’m going to forward this to, mainly for the last paragraph. Don’t overdo it. Words to live by. Interesting that I was reading the other day, Creed was also Paul Newman’s choice of scent, although I’m not sure which specific one. Specific scent that is, not specific Paul Newman. In this day and age of product-mania–lotions, shave creams, shampoo, hair gel, hair spray, hair conditioner, night and day creams, foot cream, etc. . . . it is hard to even be able to avoid fragrance before putting on fragrance! I have worked hard to eliminate all fragrances from all of the above products and use as little on my hair as possible (most of it is terribly expensive, turns to goop after a month and sits on the shelf unused anyway). I find the higher-end skin products (speaking for ladies at least) tend to have little or no fragrance, and are the most pleasant to use. The only parfum/toillette that I wear are those from true floral/spice ingredients. They tend to hold up better and not ‘turn.’ I never apply fragrance in the morning–the ‘soap and water’ approach is best. Heady fragrance is best reserved for evening. Annick Goutal is my all time favorite–she offers suitable fragrances for any season, any time of day or evening. Beautiful on the vanity as well. I had a torrid affair many moons ago with a man who wore Safari. I used to keep a hankerchief with it sprayed on it in my purse. He always wore suits, praticed law and drove one of those little vintage Mercedes convertables. Hm. It’s funny how scent can conjur so many memories! And Annick Goutal has home fragrances as well–their Noel candle is classic Christmas, the scent of beautiful evergreen. Home fragrance would be another great subject to address, Mr. E! I’m not crazy about fragrance on men, but I could make an exception for Green Irish Tweed! 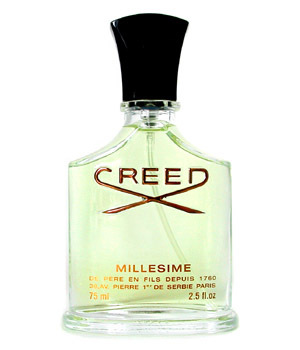 I see that another commenter mentions home fragrance, and I note that Creed makes a candle in the Green Irish Tweed scent . . .
Do you know the excellent book Perfumes: The A-Z Guide by Luca Turin and Tanya Sanchez? I’ve looked up the entry for Safari, and … you may want to read it for yourself! I quite like Royall Mandarin. My wife threatened to leave me if I ever wear it again. I live my I Coloniali! Thanks for mentioning it. I still have a bit of a stash aging in a nice wood box. Cornflower. I don’t know the book. I can only imagine what it says about Safari, it is a L’Oreal fragrance after all. That said, if Mrs. E. liked me in Old Spice, I’d be first in line at the drugstore. Paula, Annick Goutal is delightful. SubPrincess, I’d settle for the convertible today. Turling, I didn’t know that. Must go well with beer and motoroil, too. That’s versatility. elegantologist, a typo i believe as you have mixed up edt and edc. thank you for answering my query and providing us with wonderful recommendations. i shall try safari and see if i like it. i would have pegged you as an equipage man myself. but safari seems to be equally fitting. paula, i think it is mr. taylor from taylor of old bond st. unless of course i am confusing this with a newer startup. you may also want to look at diptyque and santa maria novella for candles/ home scents. cornflower, the review on safari goes something like wearable/ trashy/ burt reynolds on a bearskin rug i believe lol but scent is so subjective. i love many of those he rated 2 stars. Yes, Bond Street, that’s it! Thank you! I’m like you, I tend towards citrus, especially for summer. Have you tried Pamplelune, the graperfruit scent by Guerlain? It is wonderfully true to the name, and lasts much longer than other citrus note scents. I fell in love with it on a trip to Paris. Guerlain scents are superb because they have a much higher proportion of natural essences in them than the fragrances of other houses. Fragrances are of course expensive. I’ve picked up many excellent bottles at estate sales and thrift stores…the top 10% may be used but the fragrance in sprays is sealed in so still perfectly good and fresh. Usually you can get a bottle of the top brands for $10.00 rather than $100.00 at a department store. Don’t you think it is more elegant when you can use it liberally? Don’t forget to put some on your fine voile handkerchief! SwF, I tend to understatement with scent. That said, during summer it is nice to be able to liberally dose yourself with a refreshing fragrance. I realize I’m a little late on this, but I’m catching up on my reading today. Regarding the amount of scent to apply for men; in my formative youth I read that scent should be applied so that only those within an intimate distance would notice it. I have held on to that bit of advice ever since.